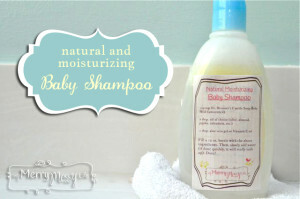 This is an amazingly simple recipe for a 100% natural, organic, safe and easy to make baby shampoo developed by Sara at MyMerryMessyLife.com. It doesn’t contain the questionable ingredients found in commercial baby shampoo like lauryl sulfate, parabens and other preservatives. Instead of paying $10 to $15 for a 12 ounce bottle of commercial baby shampoo, how does $2.82 sound for 12 ounces of a safer shampoo for your baby? Also there are only 3 ingredients in this great recipe, so it’s a very simple recipe. Click on the How to Make Homemade Moisturizing Baby Shampoo link below to see Sara’s recipe.